Arunachal Pradesh Chief Minister Pema Khandu today thanked PM Modi for approving the North East Industrial Development Scheme (NEIDS), 2017 with financial outlay of Rs.3000 crores upto March, 2020. Lauding the step as visionary, the Chief Minister said the scheme will boost industrialization, income generation and growth of jobs in the North East. He appreciated Prime Minister for bringing out such policy necessary to address regional growth imbalances. The Chief Minister said the industrial units set up in the region will get a host of tax breaks and incentives from the government, capped at Rs 200 crore per unit. Aimed at encouraging micro, small and medium enterprises (MSMEs), the new scheme will help generate employment in the north-eastern states. 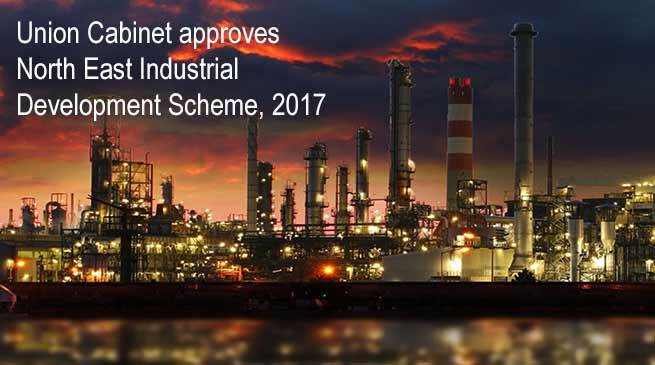 The scheme will provide reimbursements of up to the extent of central government share of CGST and IGST for five years from the date of commencement of commercial production by the unit. Besides, reimbursement of centres share of income tax for first five years, including the year of commencement of commercial production by the unit would also be provided. Under Central Comprehensive Insurance Incentive (CCII), reimbursement of 100 per cent on premium for insurance of building and plant and machinery for five years from the date of commencement of commercial production by the unit will be provided. Under the transport incentives, the government will provide 20 per cent of the cost of transportation including the subsidy currently provided by the Railways/ Railway PSU for movement of finished goods by rail. It also includes an incentive of 20 per cent of transportation cost for finished goods, for movement through inland waterways. Further 33 per cent of transportation cost of air freight on perishable goods (as defined by IATA) from the nearest airport to the place of production to any airport within the country will also be provided. The government shall pay 3.67 per cent of the employers contribution to the Employees Provident Fund (EPF) in addition to the government bearing 8.33% Employee Pension Scheme (EPS) contribution of the employer in the Pradhan Mantri Rojgar Protsahan Yojana (PMRPY). Entrepreneurs will also get Central Capital Investment Incentive for Access to Credit (CCIIAC), which will be 30 per cent of the investment in plant and machinery with an upper limit of Rs 5 crore on the incentive amount per unit. A central interest incentive (CII) has also been provided which will be 3 per cent on working capital credit advanced by eligible banks and financial institutions for first five years from the date of commencement of commercial production by the unit.